While acknowledging that no government program can ever replace a parent’s love, Obama said anyone can act as a mentor or a friend to a child in need of a parental figure. Citing his mentorship program launched this year, “My Brother’s Keeper,” Obama said an “all-hands-on-deck effort” is needed by the government to help youths reach their full potential. In his weekly address, the President said he will hold the first-ever White House Working Families Summit to bring modern-day families together. “We’ve still got too many workplace policies that belong in the 1950s, and it’s time to bring them up to date for today’s families, where oftentimes, both parents are working,” the President said. The summit will occur on June 23rd. "if i had a son i would not let him play football" says it all. Obama is helping no one. He is creating a dependency on government, that will destroy all of America. Happy Fathers day to all the Dad's who want a better life for there children and a quality of life for all our children . Just think some people weren't aren't just missing a father for guidance there missing anyone for guidance. Unfortunately, I don't think those people ever even see the light of day on programs like my brothers keeper. Or know mentor programs even exist. Get yourself and your philosophy out of the way of American fathers so they can earn a living instead of the new normal of food stamps and no good quality jobs- PS poverty is at an all time high as is the % of working Americans. Iwonder if moochey is still proud of her country yet. He'd be a far better example of a father if he showed at least one sign of being a strong leader. 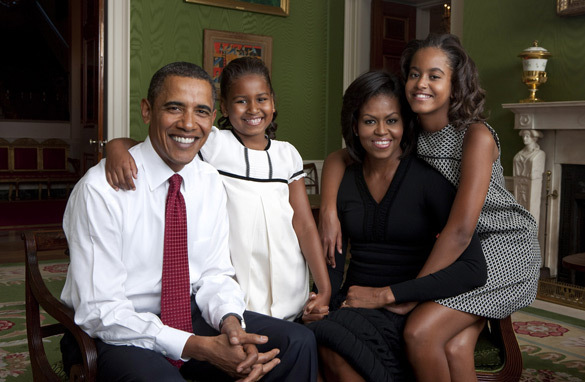 Given his performance in office, I'd have to say it is Michelle who is the strong leader in that family. Obama has shown no signs of it in 5.5 years. If he parents the way he runs the U.S. got to pity those kids. He may can lead his 3 family members and be a good dad but he and the dems have not a clue how to lead america . This alone shows what a dupe this man is. Where to start, how about if moms and dads are earning minimum wage they shouldn't be moms and dads, they can't take care of themselves let alone a family. How about understanding that a raise in minimum wage labor is passed directly to the consumer, the same minimum wage earner you're trying to help in this dog chase tail scenario. How about initiating some accountability in the segments of society that just can't seem to take care of their own well being? Tough love baby, how about some government programs to actually make blue collar trades jobs higher paying by ejecting illegal labor? Obama needs to be impeached along with Eric Holder and Harry Reid for the well being of our Nation, accept it, it has been an epic FAIL. So , now, obama is joining hilary as a victim..? Last I heard, he had a father and 2 loving grandparents and was raised in relative luxury..